I believe you can say to the founders of this great nation, "Here I am, a youth, a young tree whose roots were plucked from the hills of Lebanon, yet I am deeply rooted here, and I would be fruitful. It is to be free in thought and deed, but it is to know that your freedom is subject to the other person's freedom. It is to stand before the towers of New York, Washington, Chicago and San Francisco saying in your heart, "I am the descendant of a people that builded Damascus, and Biblus, and Tyre and Sidon, and Antioch, and now I am here to build with you, and with a will. It is to be proud of being an American, but it is also to be proud that your fathers and mothers came from a land upon which God hid his gracious hand and raised His messengers. 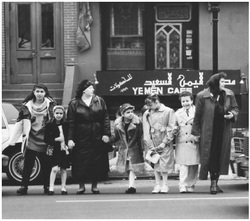 Arab Americans trace their roots to many places, including parts or all of Algeria, Bahrain, Djibouti, Egypt, Iraq, Jordan, Kuwait, Lebanon, Libya, Mauritania, Morocco, Oman, Palestine, Qatar, Saudi Arabia, Somalia, Sudan, Syria, Tunisia, United Arab Emirates and Yemen. Some Arabs are Israeli citizens. When did Arab people come to the United States? Like many peoples who came to the United States, Arabs were seeking opportunity. Factors in the first immigration were Japanese competition that hurt the Lebanese silk market and a disease that hurt Lebanese vineyards. Most early Arab immigrants were from Lebanon and Syria, and most were Christian. This need not be an either-or issue. Arab Americans have dual loyalties. While they may be closely tied to their countries of origin, most Arab Americans were born in the United States, and an even larger majority have U.S. citizenship. This is reflected in the expression, "Truly Arab and fully American." Christa McAuliffe, the teacher/astronaut who died aboard the space shuttle Challenger; Indy 500 winner Bobby Rahal; Heisman Trophy winner and NFL quarterback Doug Flutie; creators of radio's American Top 40 Casey Kasem and Don Bustany; Mothers Against Drunk Driving founder Candy Lightner; Jacques Nasser, president and chief executive officer of Ford Motor Co., and Helen Thomas, former dean of the White House press corps. While the census does not specifically classify Arab Americans, it does collect enough data to present some population characteristics. Some of that information is on the U.S. Census Bureau's Web site at www.census.gov, and is reflected in this guide. Arab Americans are, on average, better educated than non-Arab Americans. The proportion of Arab Americans who attend college is higher than the national average. Compared to the norm, about twice as many Arab Americans, in percentage terms, earn degrees beyond the bachelor's degree. Key factors in this question are country of origin, length of time in the United States and gender.